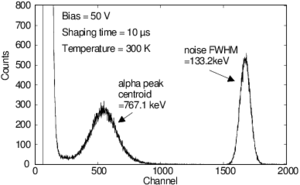 It was recently shown that the energy resolution of Ce-doped LaBr3 scintillator radiation detectors can be crucially improved by co-doping with Sr, Ca, or Ba. Here, we outline a mechanism for this enhancement on the basis of electronic structure calculations. 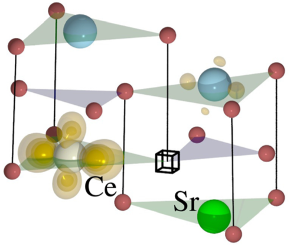 We show that (i) Br vacancies are the primary electron traps during the initial stage of thermalization of hot carriers, prior to hole capture by Ce dopants; (ii) isolated Br vacancies are associated with deep levels; (iii) Sr doping increases the Br vacancy concentration by several orders of magnitude; (iv) SrLa binds to V Br resulting in a stable neutral complex; and (v) association with Sr causes the deep vacancy level to move toward the conduction band edge. The latter is essential for reducing the effective carrier density available for Auger quenching during thermalization of hot carriers. 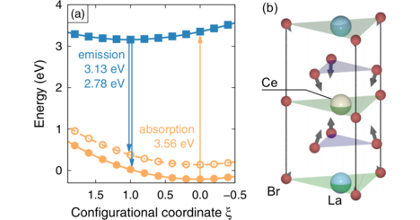 Subsequent de-trapping of electrons from SrLa-V Br complexes can activate Ce dopants that have previously captured a hole leading to luminescence. This mechanism implies an overall reduction of Auger quenching of free carriers, which is expected to improve the linearity of the photon light yield with respect to the energy of incident electron or photon.